The front of the Reflex Table is designed with a 1/2 circle radius cut out for easy accessibility, for close-up work and wheelchair application. The 30" x 40" top is constructed of scratch-resistant Melamine® and has a raised, black, PVC edge that prevents items from falling off the table surface. 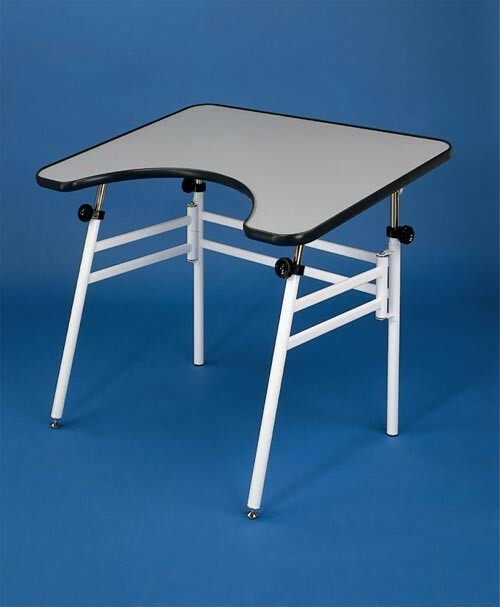 The base of the table is wide enough to allow wheelchairs to maneuver easily. Distance between legs is 28 3/4". Easy-grip knobs adjust telescoping legs to heights, 29" to 44", and angles, 0° to 45°. Folds flat for storage. Perfect for home or hospital. Some assembly required. 427 points will be rewarded when you are logged in to your account and buy this item.